A HeatMasterss furnace can tie into your home heating system very effectively. The radiator element can be installed into the existing plenum of your furnace as well as the hot water system. Heatmasterss outdoor furnaces come with easy access rear doors and ball valves making plumbing and maintenance quick and easy. 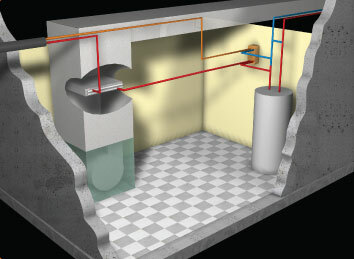 Insulated underground pipe enters the rear of the furnace through the floor and connects to the valves with pex or pex-al-pex plumbing fittings. The pump is installed on the supply outlet to push water to the building being heated. You can also adjust your air injection using the dampers on the fan box located on the back wall of the furnace to ensure maximum burn time and fuel efficiency. 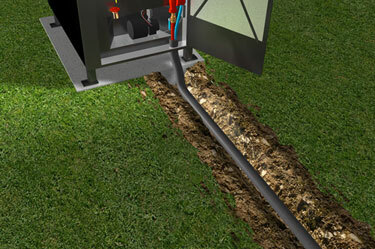 To heat the home or structure, the outdoor furnace pumps hot water indoors via insulated underground pipes. Once the water enters the structure, it travels through traditional heating systems, including a radiant baseboard, a forced-air furnace or a radiant floor system, and then circulates back to the furnace. 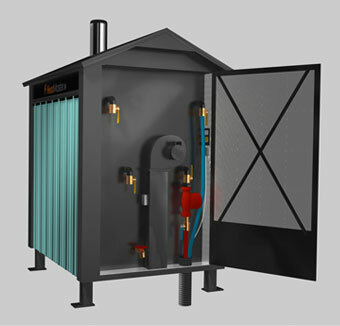 The HeatMasterSS system is perfect for garages, shops and other outbuildings. 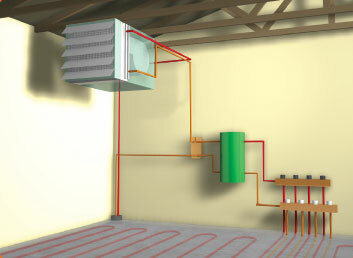 It will power an overhead forced air heating unit or in-floor heating using a boiler. An outdoor furnace is typically installed in your backyard, 25 to 300 feet away from the building or the structure you intend to heat.